This card has a fascinating pop up mechanism. The two outside candles fold forward toward the cake and the two inner candles fold backwards toward the 16. When it collapses you can't believe the candles can possibly fit inside the cake! Here's the plain paper mock-up. The light gray pattern is the original, printed from Robert Sabuda's site. Changes in black. First, I changed the angle of the inner candles a little so they wouldn't hide the 16 I wanted to add. 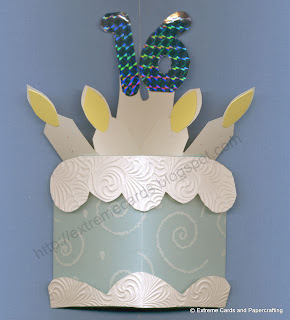 Here are the pieces of the cake: blue cake, velum swirl overlay, embossed paper icing. I cut off the icing pieces on the original pattern because I wanted to use a different paper, and added the velum. It is just glued down around the edges, all of which are covered when it's done. Candle fold out and flames. Pop up support. Numbers cut from self stick paper. The foil photographs a little weird, it's actually blue and purple to the eye. 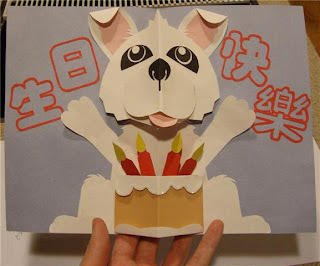 The outside of the card says Happy Birthday in a bunch of different fonts and sizes. A look at the backside of the pop up mechanism. The inside of the finished card. Nick Eng sent me a picture of one he made. Love the dog!